Trump’s election ignited a new wave of activism, which appears to have had a significant impact on the 2018 midterms. It’s too early to tell how this will ultimately affect policy outputs, but there is good reason to think that it will. Ideology is a poor indicator of Democrats’ policy priorities; moderate, progressive, and socialist Democrats seem to broadly agree on what the Democratic policy agenda should look like. On the other hand, Democrats who are highly engaged in activism appear to have distinct priorities from Democrats on average. Activists are far from homogenous both demographically and in terms of their view of politics, and activists’ views don’t seem to fall cleanly into any of the prevailing narratives about Democrats. Nonetheless, level of activist engagement is still a useful metric for understanding the dynamics of the Democratic base. YouGov polled a nationally representative sample of about 1,900 Democrats, and respondents were asked about whether or not they participated in activities like calling an elected representative, donating to candidates, protesting, running for office, and several more. The number of different activities that someone participated in gives us a coarse but meaningful measure of self reported engagement in activism. About 18 percent of Democrats reported that they had not been involved in activism, while about 40 percent had participated in 1-3 of the activities that we asked about. About 12 percent of Democrats participated in eight or more of these activities. Activists tend to be more likely to identify as strong Democrats, as opposed to weak democrats or Democratic leaning independents. Activists are much more likely to identify as progressive or socialist, but despite being the most ideologically left, activists tend to be pragmatic as well. For example, activists were much more likely than non activists to say that Democratic candidates should have the leeway to tailor their message to their own local context, as opposed to Democratic leadership imposing a strong national platform on all its candidates. Democrats generally view primarying Democratic incumbents as a positive and effective way to keep Democrats on task and to advance Democratic values. Activists were more likely to hold this view, but also slightly more likely to hold the view that primarying Democrats is counter productive since it causes disunity. Activists were much more likely to have an opinion on primaries one way or the other, but interestingly the most engaged democrats were also the most divided over the usefulness of primaries. 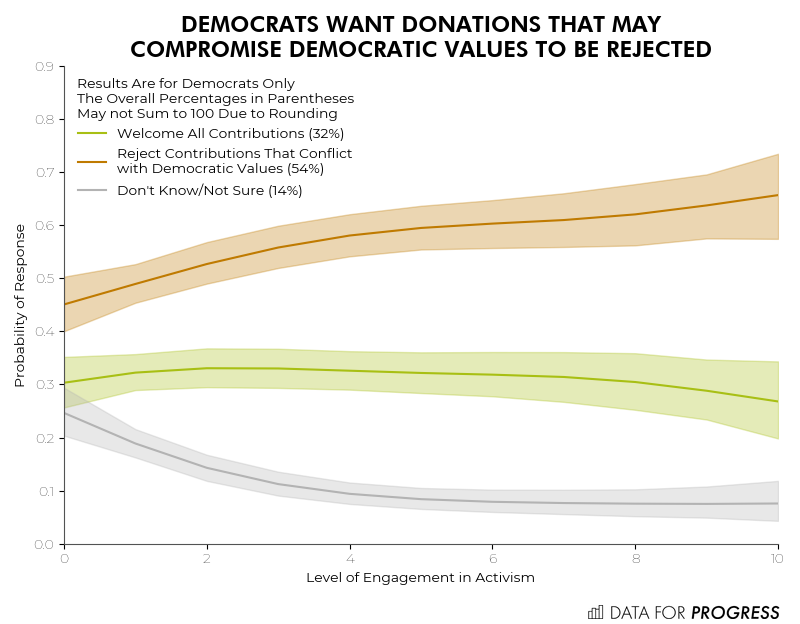 In addition, activists don’t think Democrats should compromise their values by accepting money from organizations that contradict progressive values. Activists strongly prioritize checking the abuses of the executive branch over cooperating with Trump to pass major legislation. The most likely policy area for bipartisan compromise is infrastructure, and a few Trump administration officials have hinted that a large infrastructure package would be on the table if Democrats won the house. However as one might expect, the Trump administration proposal is full of pork and ignores crucial deficiencies in the nation’s infrastructure. Democrats have a clear mandate from their base to use their leverage to prevent the president from abusing his power, and should ensure that any bipartisan infrastructure deal meaningfully addresses climate change and is not just a cronyist giveaway. The fact that Democrats, and activists in particular, overwhelmingly want to see Democratic legislators check Trump’s abuses suggests that we may see support for Democratic leadership erode if they do not live up to this expectation. Support for Minority Leader Schumer and soon-to-be House Speaker Pelosi is not particularly high at the moment, and while activists lean towards replacing them with someone less compromising, this view is far from unanimous. It’s also worth noting that activists and non-activists alike tend to have a more favorable view of Schumer than Pelosi, despite the fact that Pelosi is a far more effective leader. If activists begin to perceive a Resistance Deficit, where party leadership does not match the activists’ enthusiasm in opposing Trump, this could change. Pelosi has made several appeals to bipartisan cooperation, but has also recently unveiled sweeping pro-Democracy reforms that Republicans are almost certain to vehemently oppose. It’s much too soon to tell if Democratic leaders become resistance heroes or not. Lastly, one of the most notable findings about activists is that they are much more likely that non activists to support abolishing ICE. This is perhaps not surprising given that the movement to abolish ICE was born from Immigration Rights activists groups such as United We Dream, Make the Road Action, and the Detention Watch Network. Immigration is one of the most polarizing issues in the country and Republicans’ campaign strategy appears to be nothing more than inflaming the nativist tendencies of their base. However, the country as a whole has been moving leftward on immigration, and the Abolish ICE movement may have already played a role in this. As ICE records record levels of detentions and scales up their raids, the need for a robust activist movement to protect migrant rights is more clear than ever. We have only provided a very superficial descriptive overview of Democratic activists here, and we reiterate that activists are not a monolith and are in fact relatively split on several topics, most notably on their support of Democratic leadership. However, it general activists have high expectations of the new Democratic majority and appear to be a leftward force within the Democratic base. Just last Tuesday, a group of activists from the Sunrise Movement were joined in a sit in by Alexandria Ocasio-Cortez, demanding that Speaker Pelosi support Ocasio-Cortez’s resolution to establish a select committee on a green new deal. Subsequently incoming congresswomen Rashida Tlaib and Deb Haaland endorsed the resolution along with incumbent Ro Khanna. In all likelihood, we’ll be seeing more of these actions in the coming months. Colin McAuliffe (@ColinJMcAuliffe) is a co-founder of Data for Progress (@DataProgress).